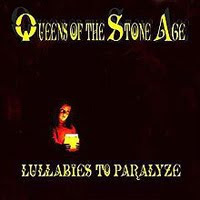 While this is definitely my least favorite Queens of the Stone Age record (and the one with the hokiest title), given their previous output, it's not shocking that they couldn't - in my mind at least - find a way to top their first three insanely good records. And don't get me wrong: this isn't a bad group of songs, by any means. It's just cursed by being preceded by three albums that were very, very strong. Maybe it has something to do with the departure of Nick Oliveri, or the fact that Homme, aside from a few vocal turns by Mark Lanegan, is playing with an entirely new group of dudes. It doesn't make for an awkward sound, but the focus on trying to be dark and devious is a little too pronounced in parts. The 1-2 combo of a pair of seven-minute songs, "Someone's in the Wolf" and "The Blood is Love," right in the middle of the record, is a bold move, and one that usually finds me zoning out. The tracks fit the atmospherics laid out by the creepy blues of the awesome "Burn the Witch" and the steady stomp of the great "I Never Came," but they just don't pack the same oomph. But plenty of the other songs do. "Tangled Up in Plaid" is huge, and "Everybody Knows That You Are Insane" is a fantastic track to follow the two two-minute pre-thoughts that kick off the record. "Little Sister," the first single from this album, isn't as immediately catchy as some of their other lead singles, but its grittiness and speed are sweet. "In My Head" was never one of my favorite Queens songs, but it works as a single, and I definitely don't dislike it. Along with the two seven-minute songs I mentioned earlier, the tail end of the album drags a little bit, with "Skin on Skin" and "Broken Box" sounding slightly b-side-ish. But "You've Got a Killer Scene There, Man..." and "Long Slow Goodbye" end things on a solid note, with some of the more sparse and groove-y material on the record. So, like I said, definitely not a bad record. In fact, it's a pretty damn good record. But it does sound a bit like a band trying to figure out where they're going next, and I guess that makes sense. Part of me misses Oliveri and his wild vocals, but part of me also enjoys the mostly Homme-fronted version of the band, because it seems more steady. Which is something the Queens hadn't been before. And that, somehow, makes this album their weirdest one.